Any disputes between states concerning the interpretation or application of the Convention are to be submitted to arbitration if the states have not chosen by declaration the same court or tribunal or reached an agreement otherwise. For this reason, arbitration might become one of the most common procedures - in theory. Practice may well prove otherwise. If only two parties are involved in a dispute, the arbitral tribunal consists of five members (involvement of more than two parties can cause an increase in the number), preferably to be chosen from a list of arbitrators maintained by the UN Secretary-General. Each party may nominate one arbitrator at its discretion, and the parties jointly nominate the remaining three arbitrators. 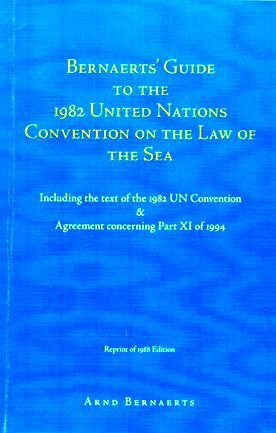 If one or all of the parties fail to nominate the required arbitrators, the President of the Tribunal of the Law of the Sea is to appoint them. The arbitral tribunal has only one-quarter the number of members of the Tribunal for the Law of the Sea (twenty-one). A further significant distinction is that the states parties to the dispute must bear the entire expense of the arbitral tribunal, both their own costs and the expenses of arbitration in general (otherwise, only their own costs). While procedure before the Tribunal for the Law of the Sea is determined by the Tribunal itself as a general code, each arbitration tribunal determines its own procedure, and the parties may even agree to determine procedure themselves. General principles of procedure in respect to effect of non-appearance or failure of a party to defend its case, decision by majority, award, and a final and binding award correspond basically to those of the Tribunal for the Law of the Sea. Even provisional measures may be prescribed by the arbitral tribunal. 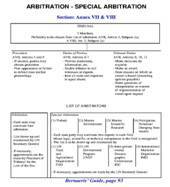 Special arbitration differs from arbitration in only two respects; consequently, the general provisions of Annex VII apply accordingly for procedure under Annex VIII. The arbitral tribunal is distinctive with respect to the lists of arbitrators. A list of highly-qualified arbitrators is to be prepared for each of the following subjects: (1) fisheries, (2) protection and preservation of the marine environment, (3) marine scientific research, and (4) navigation, including pollution from vessels and by dumping. 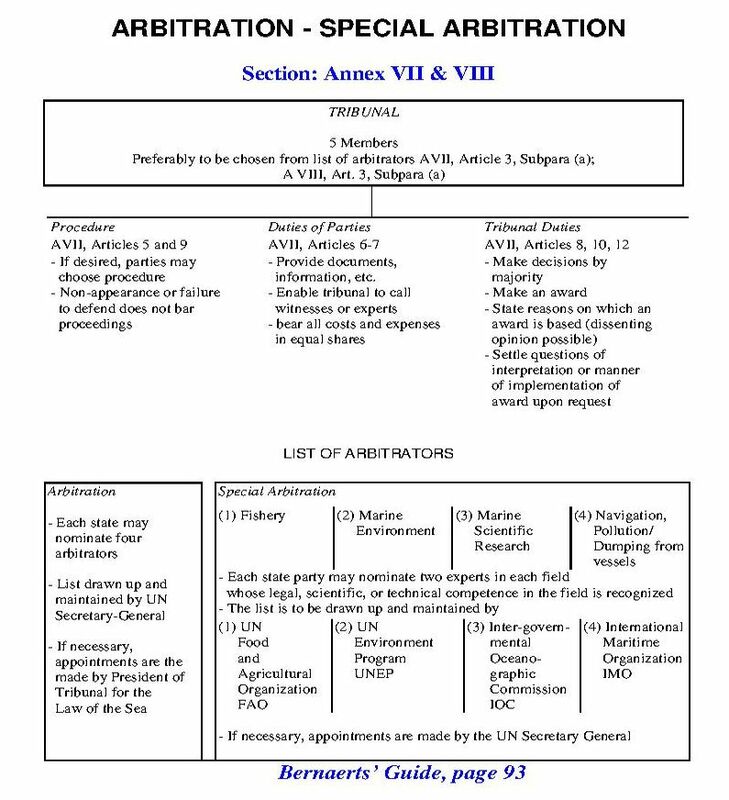 The special arbitral tribunal is to consist of arbitrators who are preferably chosen from the list of experts relevant to the matter in dispute. Each party may nominate two members, and the parties nominate jointly the president. If there is no agreement, the UN Secretary-General makes the appointment. The second distinction is a provision for a "fact-finding" procedure, according to which the facts which gave rise to the dispute can be conclusively determined. However, the parties to the dispute can agree that the results of the procedure have only the effect of recommendations which serve as the basis for review by the parties, just as they would have to agree to be bound by the findings.